Vision-Daptor | Welcome to the Intellivision Revolution! Visit the official VISION-DAPTOR site to place order. 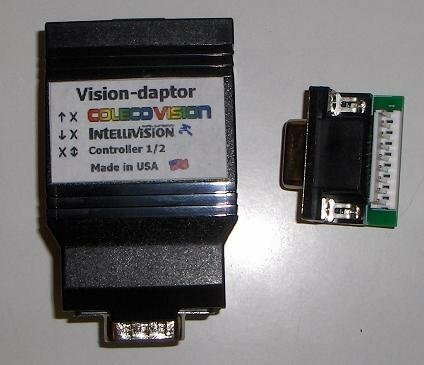 The Vision-daptor is a USB interface for connecting ColecoVision and Intellivision controllers to your PC/Mac. No driver is needed as the Vision-daptor is recognized as a combination USB HID (Human Interface Device) joystick, and keyboard. Just plug and play. It has switches for selecting ColecoVision or Intellivision and controller 1 or 2. The Vision-daptor supports the SA spinner, but I have not found an emulator that it can work with. ColEm has a spinner emulation but it does so in a way that neither the Vision-daptor or any other USB device could be made to work with. I think the Vision-daptor might be compatiable with the ColecoVision Driving and Rollers controllers, but I don't have either to check with. And these also have the same problem of no emulator support. To verify operation in WinXP, go to Start->Control Panel->Game Controllers. Select “Vision-daptor” in the list and click Properties button. Disc/stick should move the cross hair full up/down/left/right and side buttons show when pressed. Use the Controller Test Mode and PC Joystick Button Usage charts further down to check/diagnose your controller. To check the keypad, open notepad or a similar word document program. Pressing the keypad should show typed characters. The keyboard Num-Lock must be ON for testing when controller 2 is selected. Turn the keyboard Num-Lock OFF for game play. The enumeration seems to always stall under WinXP if, when the first time it is plugged into a computer, it is plugged into a USB 1.1 port. If windows does not give the device installed and ready to use notification within 30 seconds after plugging in, simply unplug and plug it back in. After that, it should install and operate fine. You can also go into Device Manager, right click on it, and select Update Driver… to restart the enumeration. The 'daptor may need to be plugged in before the emulator is started. Try exiting and restarting the emulator. Num-Lock needs to be off for controller 2 keypad game play. After changing switch 1 between ColecoVision/Intellivision modes, the USB cable must be unplugged and replugged for it to take affect! This is not necessary when just changing the Controller #, switch 2. Changes the keys sent. Joystick 1 or 2 is automatically assigned by the O/S. Set this switch to match. Num-Lock must be OFF for game play with controller 2. The Controller # just changes the keypad keys. The stick/disc and side buttons are seen as a joystick device by the PC, and whether they are used for controller 1 or 2 just depends on the order they are assigned by the O/S. You could find the stick/disc/side buttons are controlling a different player then the keypad. In which case, change the Controller # switch on 'daptors to match. Controller Test Mode: Toggle Switch 1 (down for Coleco, up for Intelli) but do not unplug/replug the USB. Controller Mapping - For setting the mapping in your emulator. Note: The PC Joystick button numbering (joy B#) in the below chart is based on the first button being 1. Some emulators many start numbering with the first button as 0. PC Joystick Button Usage - Reference for all the buttons, B9-16 input pattern maps in particular. Use Control Panel->Game Controllers->Properties and the Controller Test Mode to check/diagnose your controller operation.